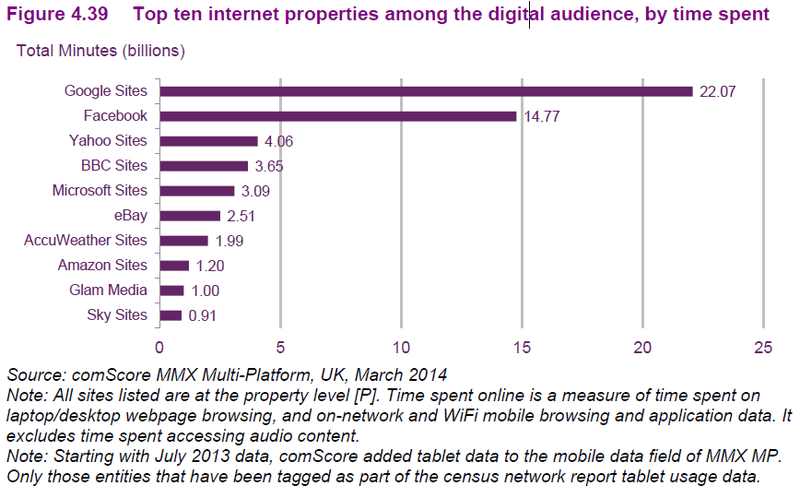 Smartphones, tablets or TV: How do we consume media in 2014? How do we consume media in 2014? And what media? And on which devices? Ofcom released The Communications Market Report in August 2014 and it’s chock full of interesting data and charts on the UK market. I’ve previously looked at mobile and tablet usage. Now I’m turning by attention to the broader topic of media uptake, in its various forms. To begin, a shocking graph that shows how media dominates our lives in the UK. 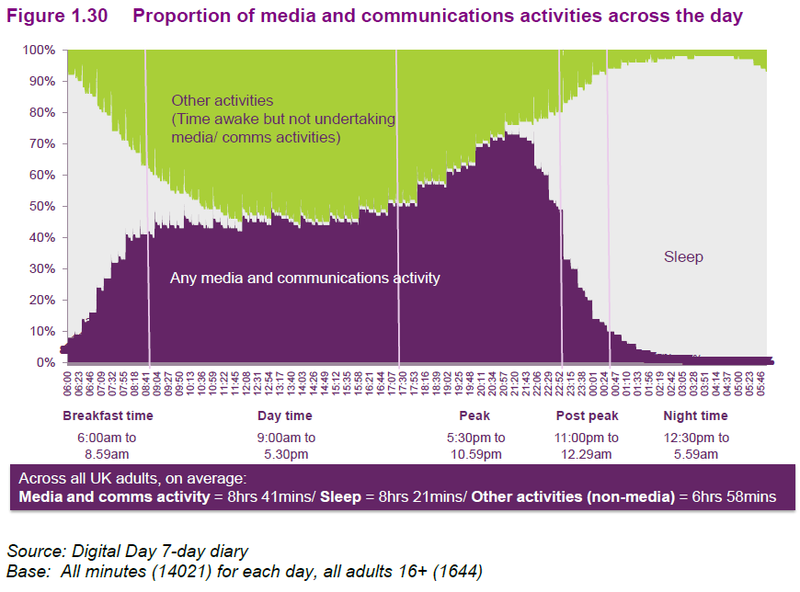 More time is spent on media and communications (8hrs 41mins) than other activities (6hrs 58mins) and indeed sleep (8hr 21mins). 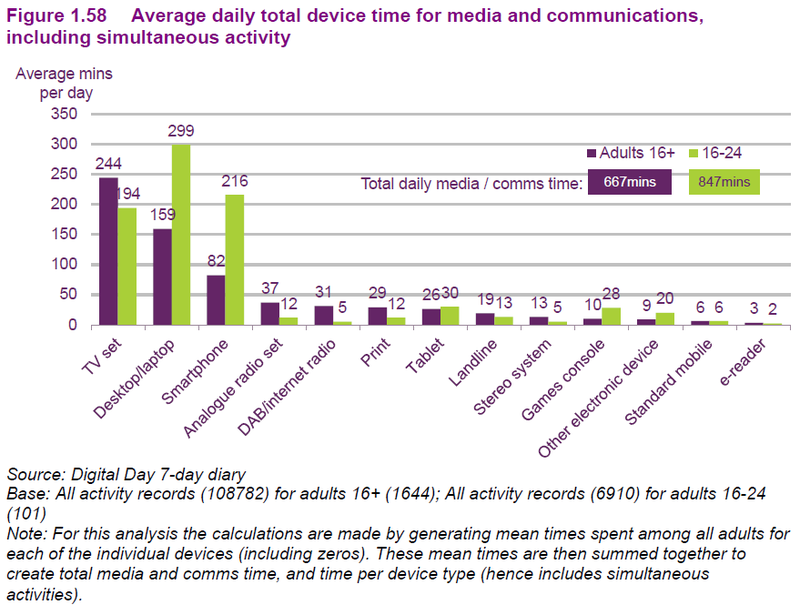 Device time for media and communications makes for an interesting chart. Just look at the paltry figures for print. Other surprising figures include the relatively low usage of tablet when compared to desktop/laptop. This is likely due to professional use of the latter. TV sets still dominate this chart, with an average of 244 minutes a day consumed by adults. However, looking at just the 16-24 year old segment, laptops and desktops top the list, with a massive 299 minutes per day. Much to digest in this chart. Firstly, one can see that the penchant of 16-24 year olds for text communications (23% of time spent) backs up the smartphone use in the chart above. This age bracket also consumes significantly more than others (14hrs 7mins). Some of this is done concurrently, which explains the 8hr 41min average across adults. This chart is a good one to see just what a hold the television set has on the public. 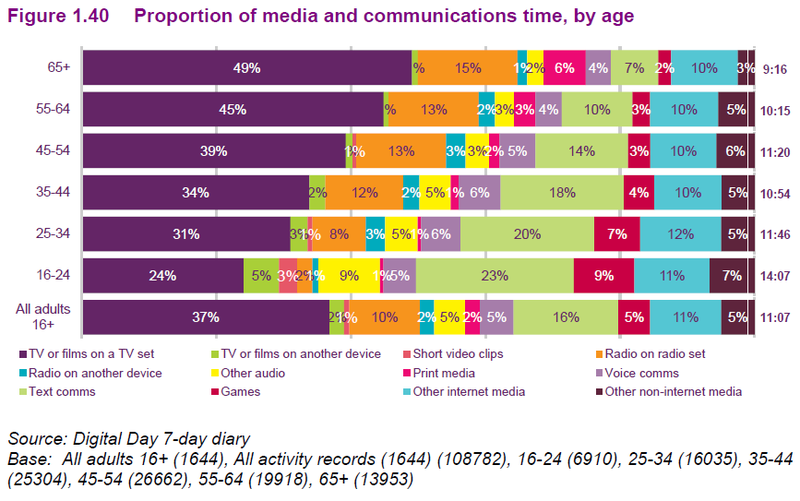 TV or films on another device takes a small slice of the pie (highest at 5% for 16-24 year olds) compared to the TV set, particularly once middle age sets in. Whether this changes will be fascinating to see, but signs are that connected games consoles and smart TVs are making the TV set a very important device for streamed media. 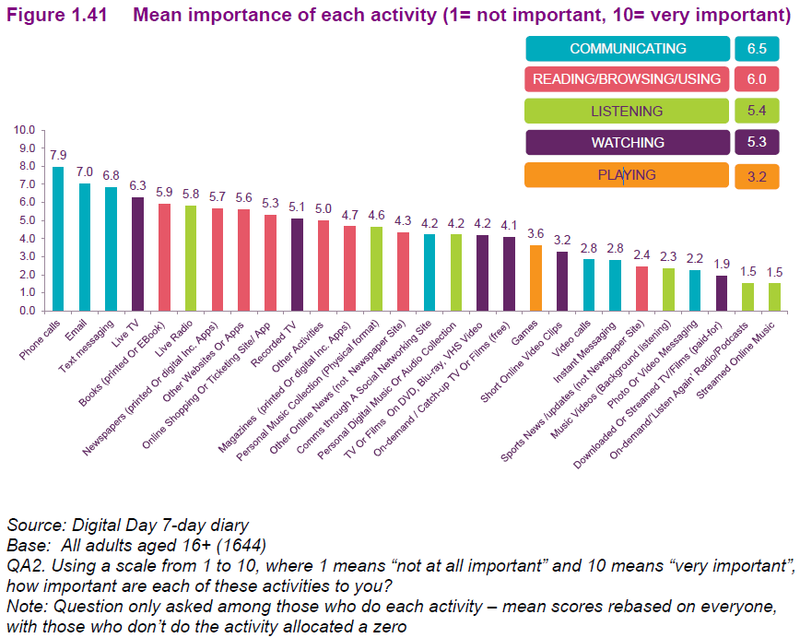 When asked, adults rank phone calls, email, text messaging, live TV and books as the most important media to them. The high ranking achieved by books (5.9 out of ten) might be slightly surprising given the average of 29 minutes spent on print (according to chart above) and some of this no doubt being accounted for by newspapers. Streamed online music props up the rear (1.5) and digital music collections rank in the middle at 4.2. I expect these figures differ dramatically when split out by age group, with 16-24 year olds valuing their subscription music more. This chart shows just what a stranglehold the two tech giants have on our internet browsing. Other surprises include eBay doubling Amazon’s minutes and Yahoo still performing respectably (perhaps through Tumblr, default homepages and, in my dreams, geocities). 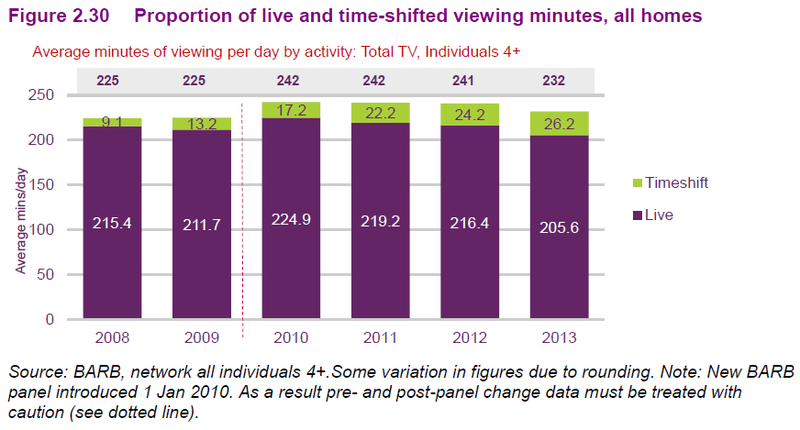 One point does not a trend make, but you can see here a decrease in average minutes of TV watched per day, from 241 minutes to 232 minutes, 2012 to 2013. This may be due to a warm summer in 2013, although 2011 was also warm. It may also be explained by the 16-24 year old group watching less and bringing the average down. One to watch (no pun intended). Watching content on demand, either free or via subscription, makes up for 4% to 13% of the watching UK adults do (depending on age group). 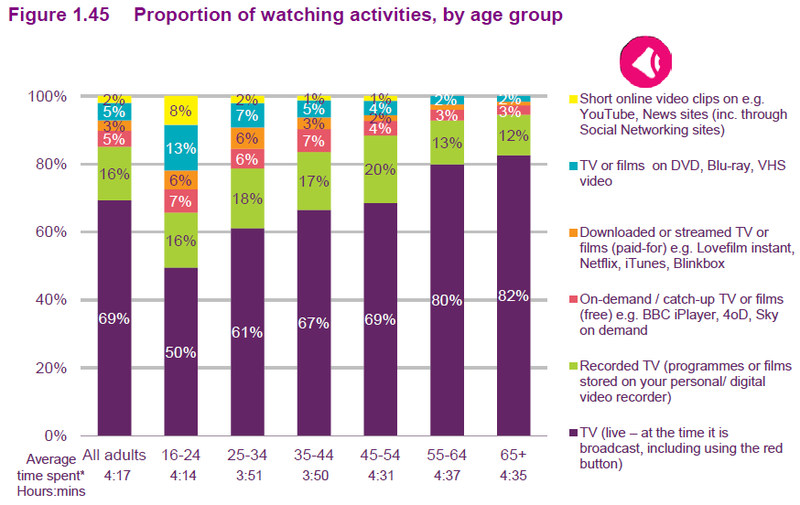 TV sets again dominate, with YouTube making a significant incursion into the lives of 16-24 year olds (8%). 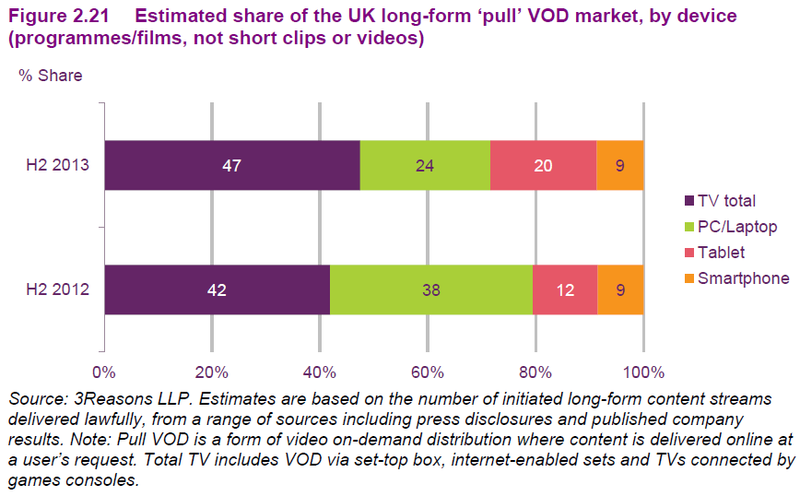 Recorded TV added to live TV makes for the large majority of each age group’s viewing. Within the view of on-demand usage, the chart below shows that tablets have taken some of the PC/laptop share, but TV sets dominate. This shows the use of games consoles and smart TVs is pretty high. Smartphone use for viewing on-demand is steady and obviously this is partly because of the diminished screen size offering a poorer experience.